The firm, which makes a range of parts for vehicle manufacturers including Nissan GB and Honda UK, operates a 61-strong vehicle fleet on a salary sacrifice basis provided by Fleet Evolution, with a growing percentage of electric vehicles and plug-in hybrids. Staff take-up is around 8% from an eligible workforce of around 900, covering employees ranging from machine operators to the managing director. The scheme has a carbon ceiling set at 140g/km but average CO2 emission levels on the fleet have fallen to 100g/km, with 78g/km for all new models, thanks to a fleet mix that comprises 40% diesel, 40% petrol and a fast-growing 20% of electric vehicles and plug-in hybrids. 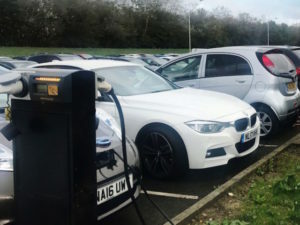 To encourage EV and hybrid uptake, Unipres has added several charge points in the corporate car park so that staff can recharge their vehicles while at work. Due to its association with both Nissan and Honda, the company is also able to offer its employees a 4-7% incentive to selected models from either marque in the shape of a rebate of the Employer’s National Insurance Contributions.